i’ve been to chicago more than i’ve been to any other city. at the somewhat green age of 23, business brought me to chicago for a week and for the first time. at that point in my life, i was head-over-heals for thai food (still am, in fact). NJ and even NYC didn’t have very many thai restaurants (that i knew of at least). but when i got to chicago and started pouring through the magazines and papers and whatever else you poured through before the internet, i found at least 5 thai restaurants. i know it was at least 5, because i went to a different thai restaurant every night of the week for the week i was there. yup. i didn’t eat anywhere else. just thai restaurants. what’s important is my more recent trips and the food and good times i’ve had. for some reason my cyber-friends guajolote and ronnie act as my personal food tour guides when i’m in town. a typical day goes like this: they swing by the hotel in about noon and i jump in the back of an enormous SUV with no idea where i’m going, or if these 2 nuts are going to hack me up into tiny pieces and throw me into the river for that matter. then we’re off to 2, 3, 4, maybe 5 food destinations, sometimes with a lot of sort-of-getting-lost-but-not-really detours. i’ve seen parts of chicago that i had no idea existed. several times in some cases. 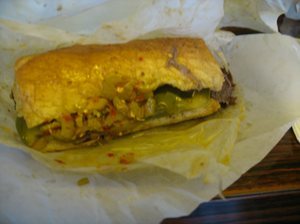 on my most recent trip, ronnie and guajolote suggested a trip to Al’s Italian Beef for lunch. 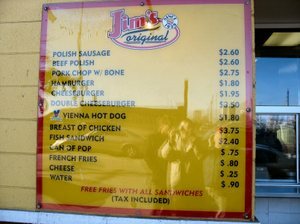 and what lunch would be complete without dessert at Jim’s Original for polish sausages and pork chop sandwiches (with the bone, of course). and then there’s the leisurely walk around a gourmet market. in this case, it’s chicago’s Fox & Obel, which to my mind rivals anything we’ve got in NYC. just a fantastic place. i can’t think of a better way to spend an afternoon in chicago. and neither can you. Jim’s Original’s menu with 1950’s prices. 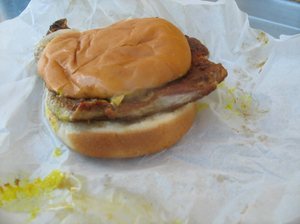 pork chop sandwich at Jim’s Original. sausage and beef combo sandwich at Al’s Italian Beef. please note that no level of digital photography equipment would have made this sandwich appear less fuzzy and sloppy because the sandwich is, in fact, fuzzy and sloppy. and delicious.